I love a wrap dress and I have now discovered the beauty of a mock wrap dress in this month's make! This style is so easy to wear and the fabric I used was a pleasure to sew. With the mock wrap skirt I never have to worry about flashing anyone when I sit or walk. I am such a fan of a mock wrap dress for work wear and when wearing this dress to work recently received a lot of compliments. This type of garment can be such a work horse since it's made from a durable ITY that I can throw in both the washer and dryer and it looks really cute with a jean jacket or knit wrap sweater- which are essential in a chilly office space. The fabric is from designer label Tori Richard which I had to google to read up on. It's a Hawaiian resort wear design house and I made a pin board with some of the dresses that Fabric Mart has carried the fabric for and you can find it here. I always love to see a fabric made up into a garment before purchasing it since it gives you an idea of the scale of the print and how it can work on your body. My fabric is a spongy ITY and there's only ten yards left. You can find it here. I used the Palmer Pletsch tissue fitting method to fit the top portion of this dress and it helped me spot some problem areas before cutting out my fabric. 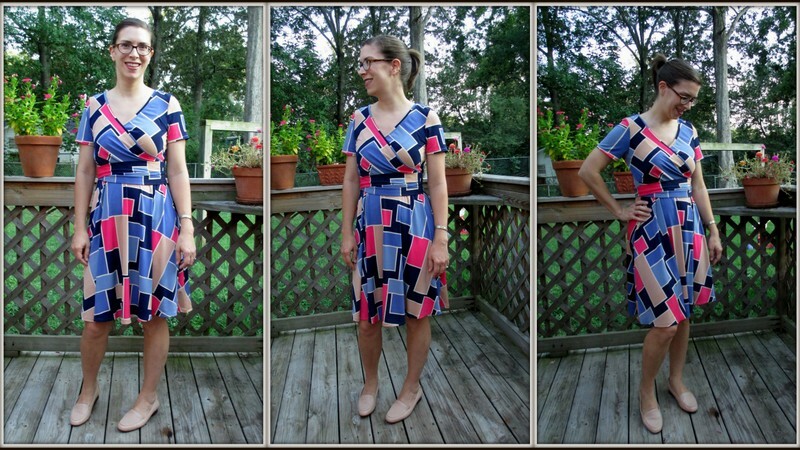 Btw many of the same fitting tweaks that I did in this post are the same that I used for this dress. I cut the neckline piece much shorter than the pattern called for so to get a snug fit around the neck but probably should take more of a wedge (I took a small wedge out) out of the front neckline piece in the future since I have rippling there. The ties are really short in the pattern, I wanted mine long enough to wrap around and tie in back or in front. I used a stretch knit needle and a zig zag stitch on my machine. I stabilized the shoulders with clear elastic and added knit tricot to the hem to avoid a wavy hemline. I did a complete blog post here about ITY knits and this finishing technique. You will have to excuse the fact that I am looking at my feet most of the time, I was being attacked by a swarm of mosquitoes! I am very ready for our heat to break and clear out those nasty critters. However, the upside of this is that my husband took about a billion pictures of me bending, swatting and slapping all those mosquitoes and you can see from the pictures above that the dress stays put really nicely even with all that action. If you remember there was a wrap dress challenge in the last Fabricistas Fashion Challenge and there were so many cute entries that you can view here. And if you haven't noticed they just posted the contestants for this year's challenge. You can see all the contestants HERE. Beautiful wrap dress and thanks for the Pinterest board inspiration. I like the second dress but wonder if it would be better as a top or tunic? Or stitch in some pleats to make the volume of the dress less? Thanks for all the fitting tips, too. You have such a nice figure, I don't think the dress does you service! Too much fabric for your small frame. Lovely mock wrap. It really suits you. I am afraid I am too lumpy for an ITY knit, but I could see myself in a ponte or double knit, something more substantial, or make a cardigan to throw over an ITY knit. They do come in such beautiful colors and also many modern prints. You can try to save that dress with a belt, or decrease the amount of design ease. How about taking the flair out of the bottom half and then adding back in some triangular godets starting at the thigh and going down to the hemline? Seems you would look best in fitted, but then some flai with the flounce of a few godets. Thanks for this information! I'm considering the new look pattern for my next project! I like the mccalls pattern, but I wouldn't wear that dress without a belt. I think the combo of long sleeves and all that fabric is overwhelming without some waist definition. Your wrap dress looks great on, the fabric works so well, great info on changes made and I'm going to check out the hem info as its a huge flaw in my knit sewing. Well, I will step up and comment on the dress. I think it hides your great figure and is straying into Muumuu territory. I believe it would be better as a longish tunic over skinny pants/leggings, perhaps with a shaped hemline, somewhat longer on the sides to emphasize the drape of the fabric. Thanks for stepping up and speaking up! I appreciate your suggestions and kind words! I am definitely going to do something to make it wearable and I like your suggestion of a shaped hemline. Try belting it. The fabric is very pretty, worth making it wearable. I will probably give a black belt a whirl, if that doesn't work time to shorten and make it sleeveless! And I agree the fabric is too pretty to not wear! I like the bottom dress. Looks very comfortable. The fabric is pretty but I think the overall look ages you. I don't think belting it helps; I think it may look much better sleeveless and a tad bit shorter. I LOVE YOUR WRAP DRESS!!!!! It's perfect!! Thank you Nakisha, I loved your recent version of this dress too! And I think sleeveless and shorter may be the fix for the floral dress! I think that your floral dress is lovely. What you're dealing with is a balance issue. The original pattern showed either a sleeved tunic or a sleeveless dress. By adding the sleeves to the longer dress, you have too much visual weight on top--your fabric covered arms appear to be part of your body. Belting might help by narrowing the silhouette, but that's a lot of fabric to belt. It might make your trim waist (as revealed in your beautiful wrap dress) look thick. Shortening the sleeves rather than the hemline would re-balance the look and might even take less time than shortening the hemline. And, you can always wear a lightweight 3/4 length sleeve cardi in a solid color when the weather gets cooler. I think you hit the nail on the head, a balance issue and I think your idea of no sleeves is right and I will probably try to shorten it as well. Thanks so much for your help and kind words! Oh that wrap dress is just lovely! What a win. On the other hand, the tent dress is a bit much. Maybe you could cut it to tunic length? Perhaps with less of it the volume wouldn't drown your figure. Or maybe it's just the way it's styled...let your hair down and put on some cute boots for fall. Thanks so much for your kind words and yes, the tent dress needs an intervention so thanks for all the great suggestions! Wish I could see how cute your wrap dress turned out! So glad the fabric worked out for you! I love your wrap dress. It is very classy and looks great. The fit is right on point. Great job once again! I agree that the fuller dress as is would look great with leggings and perhaps a shorter length. Also, maybe taper the waist and bodice, remove some of the fullness in the skirt and make the dress fitted and flared. You have a great figure! I like what Peggy said! Tunic & leggings. But I do love the fabric and the tent dress still. The wrap dress is a winner. Looks great, fit and fabric are perfect. So glad and blessed that I have you for my #1 fan! Thanks Mom!